Andrea Roggi is an all-round artist because he has always loved art in its widest sense, in all its forms and variations, especially poetry, painting and sculpture, which has been for many years now the emotional climax of his extremely fertile and untiring creativity. He feels especially captivated by nature, by its perpetual cycle of creation and regeneration, by the mysterious flow of life in its most awesome and enchanting manifestations. He takes also a keen interest in the unpredictable and complex entanglements of human life, which he constantly investigates, venturing into its deepest and most secret recesses. 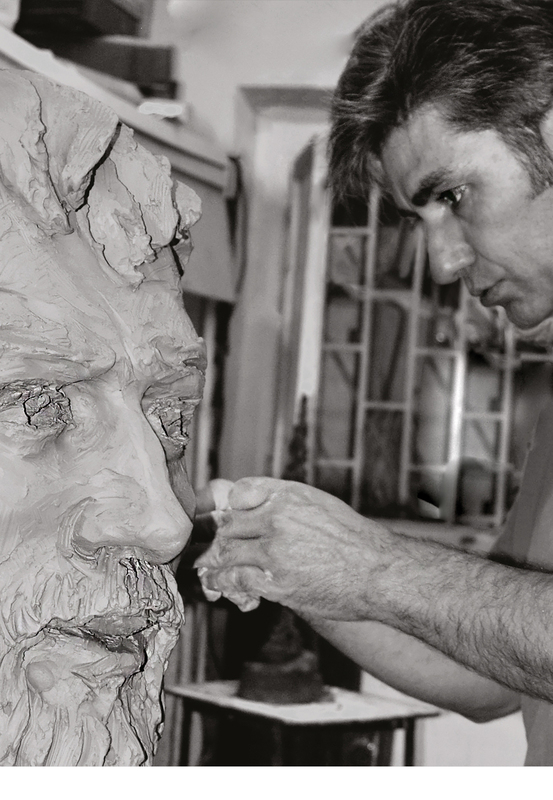 His strong focus on the human mystery is clearly visible in his sculptural artworks: by painstakingly digging in and mining out the smallest details he adds to the overall quality of relief of the human figure, explored in its inscrutable uniqueness. Most of all, Roggi seems receptive to the dreamy and wonderful world of childhood, because he loves the games, the dreams and the irrepressible, indomitable creativity that kids so brilliantly display in every situation of daily life. That is why, when approaching the realm of children, he feels somewhat like a child again, and is able to draw abundantly on a limitless source of pure imagination, amusement and playful joy… playing is living. On the whole, all of Roggi's works reveal a relentless quest to gain an insight into the fascinating mystery of life, whether it's the life running through the many different creatures of Nature or the life that is ineffably expressed by the multifaceted, extraordinarily rich and intriguing world of human beings. The playful side, apparent in all his works, is a hallmark of Roggi's art: every piece seems to reveal an existential meditation, bearing witness to a life lived to the fullest. In short, they convey a satisfied and satisfying vision of nature and human existence, disclosed in their most varied and meaningful vitality.